Using TradeStation as my charting platform always stopped me switching from a Windows computer to an Apple Mac – well not any more! I made the move over 8 years ago and have never looked back. If you’ve ever wanted to get off the Microsoft treadmill but were a TradeStation die hard (like these traders on Big Mike’s forum) then this feature article will help you take the leap. Read on. Just a short note of gratitude regarding your idea of Mac/Parallels/TradeStation. What a fantastic concept. I just purchased a MacBook and Parallels. Downloaded TradeStation and it works like a charm. It’s faster than my desktop, probably due to the Mac SS disc drive. So again, thanks. Rick W.
When I finally ditched my Dell computers, I opted for the gorgeous Apple MacBook Pro 17. This is a nicely spec’d 17″ screen laptop with 4GB RAM standard that I upped to 8GB. I spend half the year travelling so a laptop was the only logical choice. I’m also not a fan of multiple monitors so a decent size and quality screen was a must. In April 2011 I upgraded to the latest version of the MacBook Pro 17. But then during the latter part of 2011 I was plagued with performance issues and decided to upgrade to the SSD (solid state drive) version of the machine while in California. I would highly recommend getting an SSD machine – runs quiet and fast. But what a pain it is to change machines. When will they make this easier? Finally had to ditch my 17″ MacBook Pro after 4 years of almost perfect performance. What an outstanding machine that 17″ version was – for the life of me I can’t figure out why Apple hasn’t upgraded it. But my new MacBook Pro has 16GB of RAM and a faster processor – and that makes a nice difference. Now that I’ve moved onto a 15″ MacBook Pro, I really miss the extra screen real estate of the 17″ display. And unfortunately TradeStation does not take advantage of the “retina” display possibilities. Check out this article for a full review of the pros and cons of running TradeStation on a retina MacBook Pro. I’ve been waiting a couple of years for Apple to release a MacBook Pro with 32GB of RAM – and then they finally did! I couldn’t resist. And into the bargain I also got a faster processor, faster disk drive and quieter keyboard. Swapping to a new computer has also become easier because I now use Google Drive for storing all documents. But it turned out to be a LEMON! The motherboard failed and had to be replaced 3 times. Apple finally gave up and gave me a brand new machine. Looks like Apple had a bad first batch of these motherboards. Anyway, the replacement machine has been going well, so fingers crossed. Please note, the advice below should work equally well for laptop and desktop Apple Macs. Running TradeStation on a Mac relies on emulation software. The best is Parallels Desktop for Mac (now on Version 13). This very clever software allows you to run the Windows operating system simultaneously with the Mac operating system. It’s rock solid and fast. Two caveats though. First, to run emulation software like this on a Mac, you’ll need one that has an Intel CPU (i.e. a recent Mac). Second, Parallels runs OK with 2 monitors but anything more than that and performance degrades with noticeable lag. Although I opted to run the latest version of Parallels on my Mac it’s not your only choice. VMware Fusion is a competitor but in my research the reviews were not as favourable. Macs also come with a built-in utility called Boot Camp. This allows you to partition the hard drive and install Windows along side the Mac operating system. The only drawback is that you can’t run the two operating systems simultaneously, unlike Parallels. Then once you’ve loaded Parallels on your Mac, you install a current version of Windows (Version 10 works well). From inside Windows, launch Internet Explorer, then download and install the latest version of TradeStation (now on Version 9.5). And you’ll be able to run TradeStation on Windows, inside Parallels on your Mac. It’s seamless. 1.5 seconds to open any other minute, hourly or daily chart. Not bad. In addition it handles opening multiple, complex charts all-at-once and no crashes running TradeStation on the Mac. Something that plagued me frequently on my Dells running Windows. I have a feeling that chart opening times, particularly tick bar charts, are more dependent on the speed of your Internet connection than the speed of your machine. These tests were run in Sydney, Australia, on a good broadband connection. But bear in mind, there’s still the slow hop across the Pacific that adds a delay for me. It works. No crashes and fast. Beautifully engineered hardware, no joints, no nooks and crannies to get dirty. Very quick start up at about 15 seconds. Yes, no doubt Windows 7, 8, 10, etc. have brought Microsoft a long way. But Apple’s holistic approach and superior engineering has resulted in a machine that almost runs Windows-native software better and faster than on a Windows machine! The Windows machine makers should be embarrassed. OK. Enough of the Apple-gushy-enthusiasm. There have to be some Cons, right? New keyboard layout means re-learning or re-assigning hotkeys. In TradeStation this allowed me to totally re-think my hotkey settings, so in time I should be a little faster. But then there are all the Mac-specific commands too. “Finder” for managing documents and files is not as easy as Windows – at least at first glance. Yes, there are some nice graphic features like “Cover Flow” but I’m into speed and hotkeys. “Spotlight” (Command+Space on the Mac) appears to be a much faster way of accessing documents, files, applications, web, etc. Apple-native versions of applications need to be found and functionality re-learned. And this takes time. Don’t underestimate the time you’ve invested in becoming proficient running programs like Word, Excel, etc. The Mac versions are different – in some cases, very different. Or jump straight into the Google Docs suite of cloud-based programs. The latest “retina” (high definition) display resolution that Apple is pushing on all it’s hardware, is wasted on TradeStation. “TradeStation is hard-mapped and does not scale like a normal graphics program.” What this means is that if you set your display to “retina” definition with TradeStation, the lines (text characters, all graphic elements, etc.) will just be thinner – not any higher definition. So it’s back to the classroom for a little homework. Scott D. recommended this book for PC switchers: Switching to the Mac – The Missing Manual by David Pogue. OK, this is controversial. But I’m just telling you what worked for me. In October 2011, my Mac started playing up – running slow, spinning beach balls, excessive fan noise. The final straw was Gmail identified a virus on an outgoing email attachment. Well that started me thinking, maybe Macs can get viruses. In the hunt to find a solution I have discovered MacKeeper. I ran it once and within minutes it identified and fixed a ton of issues – including 2 viruses. Well, the difference on my Mac is night and day. It now runs super fast and is super quiet again. MacKeeper is not cheap at $90 but in my mind it’s priceless – I live on my Mac and it needs to run flawlessly. Don’t know what it fixed (despite querying the logs) but the software handles viruses, junk files, optimization tweaks, etc. I couldn’t be happier. But some people think it’s a scam – I disagree. I’m still looking for the perfect Mac maintenance software – something to make sure my Mac runs as fast as possible with no bloat, viruses, etc. A while ago I switched from MacKeeper to CleanMyMac, mostly because they seem less “scammy”. And I’m pretty happy. I’m not sure if CleanMyMac is doing everything it could to optimize my Mac. But I run it every week or so, just to give me peace of mind. Before you start moving your TradeStation onto a Mac you’ll need a full version of MicroSoft Windows 10. An upgrade version is not good enough as Microsoft sees this as a brand new installation. You’ll also need a copy of Parallels Desktop 13, as discussed above. Lastly, I’d suggest installing an anti-virus/anti-spyware program in your Windows OS. My personal favourite is AVG because it’s light-weight, fast and less than $20. I’m kind of embarrassed I didn’t know this. In Parallels, you can adjust how much CPU power and RAM you let your Windows virtual machine use. I noticed a little data bursting on my machine lately and so decided to investigate. And it turns out by increasing the CPU setting to 2 and RAM setting to 2GB I was able to make things run more smoothly. To get to this settings window, turn off TradeStation and shut down your Windows virtual machine. Then within Parallels Desktop go Virtual Machine > Configure > General and you can toggle the number of CPUs and slide the RAM setting. Remember for everything extra you give your Windows machine, you take away from your Mac machine. So go gently with this stuff. I’ve also starting using a RAM memory cleaning app. Memory Clean by FIPLAB is a free app for Mac that you can use to free up RAM memory and help your Mac run more smoothly. I don’t set the app to Auto Clean but hit the Clean Memory button when things feel slow. Update August 2018 – Stopped using a RAM clean up tool! With 32GB of RAM and the latest versions of TradeStation, I’m finding that RAM usage is not an issue any more. We also re-coded the ‘Better’ indicators for better memory usage and that has made a difference too. I haven’t run a test to see the maximum number of charts I can open simultaneously on TradeStation, but I’m routinely opening 15+ with no problems at all. There you go. 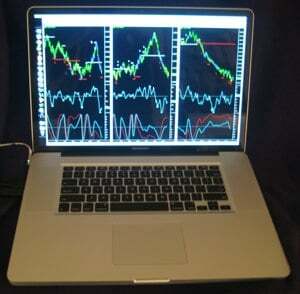 Just some initial thoughts on trading software for Mac and running TradeStation on a Mac. So far I’d rate it 9.5 out of 10. The only downside is the time it takes to adjust. It’s been 3 months now since I hopped the fence and moved to an Apple Mac. Rating after 3 months? 9 out of 10. Would I go back to Dell/Microsoft/Windows? Not on you life! After 3 months I’m now “Mac-adapted”. I’ve gotten used to the new keyboard layout, various shortcuts and the Mac way of doing things. So I’m now pretty much up to speed productivity-wise. This does take some time – and I still have a nagging feeling that I’m missing some tricks. TradeStation is 100% stable and fast on my Mac – and has been a real improvement over my old Dell machine. Which is a totally counter-intuitive conclusion! So why did my rating drop from 9.5 to 9? My wife’s MacBook Pro 15″ hard drive got corrupted. I had to re-format and re-install the operating system. On the plus side, this process was fast and easy. An absolute must is to use an online backup service (or Google Docs). Check out the Simple 5 Step Trading Backup Plan. TradeStation works well on a Mac. Not only is it possible to run TradeStation on a Mac but it’s fast, stable and easy. I’d rate my experience of running TradeStation on a Mac between 9 and 9.5 out of 10. And make sure you get a Mac with SSD. Parallels is the best emulation software solution. The secret is to use Parallels Desktop software to run the Windows operating system simultaneously with the Mac operating system. If you use Boot Camp you can’t run the operating systems concurrently. Performance is solid. Boot up times and real-time chart refresh rates are fast and certainly no worse than on a Windows operating system machine. But adjusting to a Mac takes time. You will need to re-learn and re-assign hotkey settings in TradeStation to make allowances for the different Mac keyboard layout. Plus you’ll have to find and adjust to all the Mac-native software, like Word, Excel, etc. And you might want to consider a 27″ display. The 15″ MacBook Pro screen is a little on the cramped side. I live in hope that Apple will bring back a version of the MacBook Pro with a 17″ screen. In the meantime, since I’m getting older and I don’t want to ruin my eyesight, I’m thinking about using a larger display. And thank you to all the Emini-Watch followers who contributed Mac trading suggestions.